I'm well and truly back! It's two days since my return and those two days have been work days. Jumping straight back into life after a trip is never easy. The pace is so different. This time it seems harder than ever. I had a great trip. The weather at the front end was as good as was promised. In some respects too good. At the back end things got a little wetter. We finished off with the weather that Roger was travelling headlong into. Things didn't go to plan. We had to make changes to the route as early as the first full day. In particular the tally of 2000m tops was far less than it might have been. Nothing serious though. We still got three good long days and some spectacular bivvies in a fantastic location. I'll post a full account in due course. Right now I'm working through all of my photos, converting raw files and uploading the best to Flickr and the rest to Picasa. I like working the photos. It's an opportunity to replay the trip, good bits and bad bits, and to get my head around things. When I've enjoyed the afterglow a bit longer I'll share the fun. Right now you'll have to make do with the steady stream of new photos on Flickr. Fantastic photos Dave! 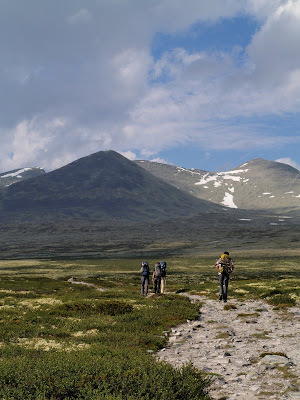 The Rondane is a beautiful part of this beautiful country. I plan to revisit there soon for a backpacking trip. Between you, Roger and me I think we experienced the full spectrum of weather Norway had to offer during those weeks. We're you plagued with bugs in the evenings too? I love the DNT path system, makes navigation so simple, just follow the T's and you can't go far wrong. I think I'm adicted to Norway. Yes, I just caught the tail end of the good weather. I had two great hill days. If anything the weather was too good as you will see as the trip report unfolds. On the last day we got the sort of mountain weather I'm more used to, I fear that Roger may have got more of the same. Bugs were an issue indeed. I was taken by surprise at how high the little buggers seem to get in your part of the world. The DNT paths turned out to be a saviour. We'd planned mainly to avoid them but found ourselves having to replan and use them. The route over Rondslottet and Vinjeronden was something we'd have been more hesitant about under the conditions had there not been a waymarked route.